David Connolly is the founder of the British Archaeological Jobs and Resources (BAJR) website and runs, along with archaeologist Maggie Struckmeier, the Past Horizons website, a web portal specialising in the reporting of archaeological news and projects from around the globe. Formerly a guitarist and key member of punk band Oi Polloi, David left to pursue a career in archaeology and subsequently worked the British field circuit for a number of years. He has also excavated and surveyed sites in far flung places such as Croatia, Turkmenistan, United Arab Emirates and Jordan. His experiences at York helped him form a keystone in his belief of the use of methodologies in archaeological practice. Currently residing in Scotland, David specialises in archaeological surveys and regularly partakes in community archaeology projects. Once there was a time without BAJR (pronounced badger) – however, very little is understood about how it became a part of British archaeology and how it has evolved into its present day form. BAJR was a creation of myself, David Connolly and was born out of a realization that although the world of archaeology can be a wonderful place to be, it can equally create very real problems for those who wish to pursue it as a career. 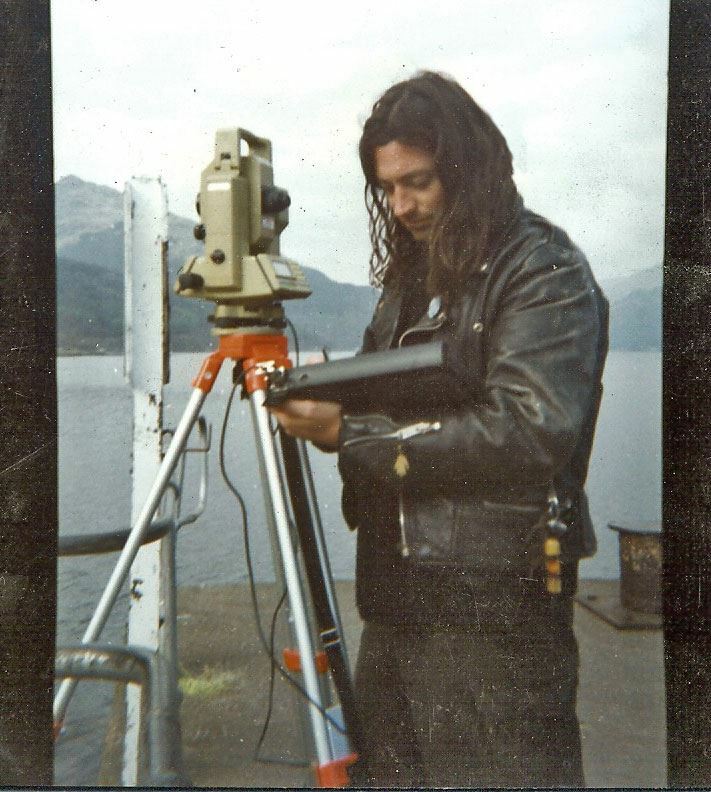 A long haired David Connolly and a trusted total station taking recordings and measurements during archaeological survey work. Survey work is a key part of archaeological field research and plays a major role in the evaluation of archaeological sites and during excavations themselves. At the end of the 1990s I was experiencing this very problem and was not in the best of places, both mentally and physically. Once in the not too distant past, the world was my oyster; I worked my way around the Middle East and Central Asia in winter and the UK circuit during the summer. But these halcyon days were not to last and I became trapped in an ever decreasing spiral of work dependence, an all too common malaise of the peripatetic jobbing archaeologist. Around 1997 my life started to change for the better when I met Maggie my wife. She seemed to see saw some sort of potential in this washed up train wreck of a man. I tried to ‘man up’ and made an effort to create a website to promote my own work, but it all felt a bit pointless. At around the same time, I became aware of a newsletter called the Digger which was a ‘tell it like it is, no holds barred’ publication, doing the rounds of the site hut. Reading this suddenly made me very aware that I wasn’t the only one out there experiencing difficulties. This led to many discussions about all the associated employment problems such as poor wages and unregulated conditions that archaeologists were trying to cope with. Maggie then suggested that I do something positive with this knowledge and take a stand. At last, I felt I had a real purpose and my sad little website got a makeover in August 1998 and became a platform to announce employment opportunities within the profession. With this new belief that we can all do something positive to change our lives and not just sit and grumble about it became the foundation stone of BAJR. It was envisaged as a resource for collecting any archaeological jobs that were on the grapevine and also to act as a means to stay in touch and communicate. Early BAJR existed in a time before social media and mobile internet. Connection was via dialup modems and field archaeologists would normally use the computer at their local library to check BAJR for jobs and then print any out to share around. 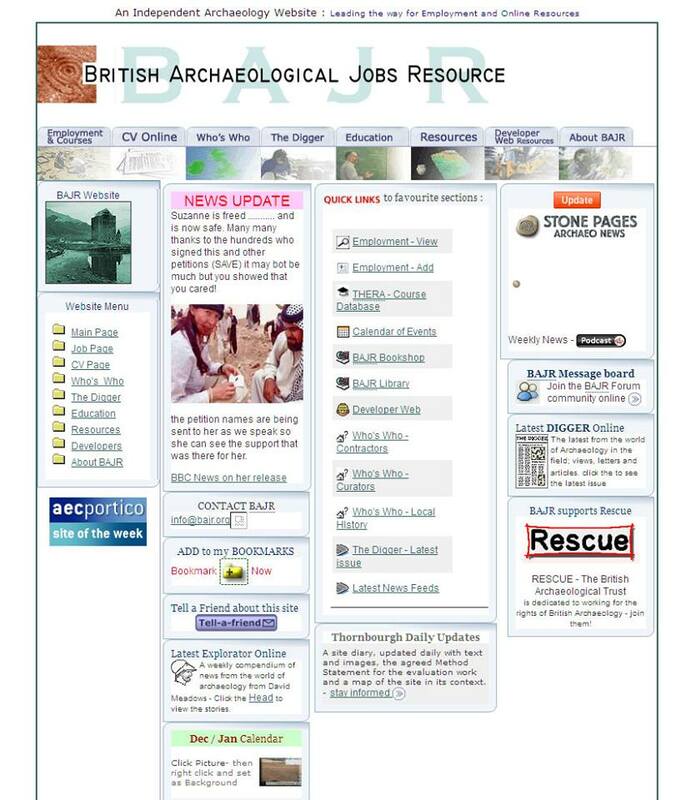 Seeing the valuable role that BAJR was now playing in the employment process, archaeology companies were increasingly emailing job adverts for inclusion onto the website. BAJR was fast becoming a popular method of finding staff, not just for digging teams, but for other roles as well. An early version of the BAJR website. This central portal ensured that postal lists were now becoming obsolete and the expense to a company of taking out a Guardian advert or similar was no longer required. Every BAJR job advert could be printed out and posted up on the walls of site huts in a matter of minutes after they were uploaded. Each advert that came in was hand transcribed from email or letter over to an html page – but this scrutiny led to interesting consequences. Examining each and every job posting provided the opportunity to question and even to refuse those that seemed to pay less than the ‘standard’ wages. Of course, this meant that criteria needed to be made clearer so that companies and applicants knew what was acceptable and what was not. A system needed to be formalised, something that provided markers for progression and pay minima grades based on responsibility. This was worked upon and then introduced, over two years and several discussions with contractors later, the nuances and present structure finally evolved. Simple to understand, it was generally accepted by most of the UK archaeological contractors as a basis for pay and conditions. It has to be stressed though that these grades have never sought to replace Institute for Archaeologists levels (PIfA, IAfA and MIfA) or even attempt to subvert them; it is merely a way for all contractors and all archaeologists who use BAJR to know what is expected and what the bottom line is. It is true to say that some people feel that the BAJR pay minima represent de facto levels, but this is not the intent. Although, every company is consulted annually on the following 12 monthly grade pay scale, the choice to advertise or not, is always in the hands of the contractor. They are free to pay less than the quoted grade if they wish, but if they do they know that their jobs will not be advertised on BAJR. 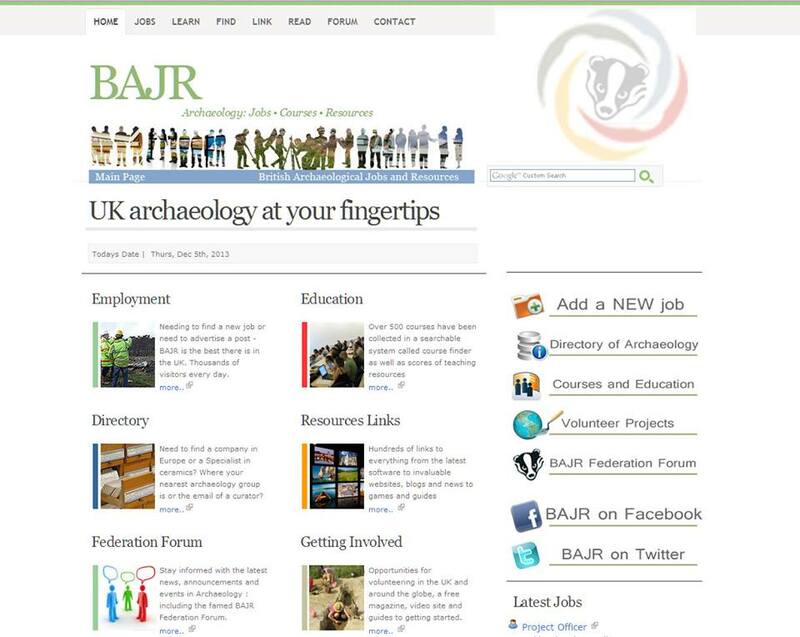 Jobs portal – It is accepted by archaeologists working in the United Kingdom that BAJR (British Archaeological Jobs and Resources) is a trusted portal for archaeology job adverts and has a strong pay and conditions ethic. Forum – BAJR also provides a platform to encourage open debate on all that is right, wrong and humorous about the archaeological profession. Information provider – A comprehensive searchable directories ranging from curatorial services to heritage courses within the UK. It is now fifteen years since the first BAJR website was uploaded but the brand and the ethos behind it has stood the test of time. The modern interactive face of the BAJR site today with each component playing a special part within British archaeology. Defining and distracting views of BAJR include misconceptions, expectations and beliefs that merged into a monolithic vision of an organisation that must be up to something, but what was that something? Robert M. Chapple has recently announced the arrival of a new archaeology essay competition for 2014. Focusing on any aspect of Irish archaeology, students at any 3rd tier educational establishment (see below) are asked to submit an original research essay highlighting the value and wealth of Irish archaeology. Robert’s inspiration for the competition, which runs from the 6th of December of this year until the 1st of November 2014, is the sad loss of his father Bob Chapple, who died unexpectedly 3 years ago. In a passionate and inspiring blog post Robert details just how his father influenced and supported him throughout his life. Particularly touching is the dedication Robert gave to his father, the first archaeologist in the family, in a published monograph shortly before his father’s death. The competition’s aim, which is sponsored by Wordwell Books Ltd who are offering a €60 voucher to the winner, is to present the work of next generation of archaeology scholars to the wider world. If you are a student, whether an under-graduate or post-graduate, this is your chance to produce a piece of original research work that will be made available to a diverse and interested audience, it is an opportunity to engage and communicate your work with the world. I, for one, look forward to reading the winner’s entry when it is published on Robert’s site and I am keen to see which topic and area of research will win the prize. Ireland has a rich and diverse archaeological record with a rich and well documented palaeoenvironmental record. Ireland is justifiably famous for the amount of well preserved archaeological finds from it’s peat bogs in the centre of the country, including bog bodies (such as Clonyclavan Man and Old Croghan Man) and Bog Butter, but Ireland also boasts some truly outstanding prehistoric and historic archaeological sites. This includes everything from Mesolithic camping sites (Mount Sandel) to the staggering Neolithic Newgrange complex, from a Viking toy boat to the utter devastation of the Great Famine in the 19th century and it’s archaeological implications. Of course the essay could be on any topic to do with Irish archaeology, from a site analysis or artefact discussion to archaeological theory and practice, it really is up to the student as to what they want to discuss and that opens a great opportunity to pursue what you love. I will keep an keen eye out for the winner and I shall look forward to further competitions after the 2014 award. Robert has taken a step forward to involve not just the researchers and archaeologists but also members of the public in helping to discover the wealth of Irish history and archaeology. In short it is a step to be applauded. The competition is open from now until the 1st of November 2014, with the winner being announced in January 2015. Further information and provisional rules on the form, content and rules of submission can be found at Robert’s blog here. The archaeological journal ‘Antiquity‘ has begun a wonderful photography competition. The archaeology themed competition (think sites and artefacts) is seeking readers to send in their photographs for each issue of the journal. In each issue the best two photographs sent in will be printed. If you are talented behind the lens and make it into an issue, you are then up for ‘photograph of the year’, which if chosen as the overall winner, results in a cash prize of £500. Photography (including the use of standard black and white film, alongside modern digital technology) is an integral part of the package of archaeology, and is used throughout the discipline in varying forms. For instance the excavation of an archaeological site and its features (such as trenches, sections and pits) are often recorded by hand and by photography, whereas aerial photography aims to cover large distances relatively quickly, helping to show landscape variation at different times of the day/year. Photography is also used up close to capture specific details and contours of artefacts, as well as used in surveying to record a landscape at different times of the year to highlight seasonal changes. This is a great opportunity to show your skills behind the lens and to capture the feeling of a site or an artefact, and to present it to a wider audience. To read the rules of the competition and submit an entry click here. 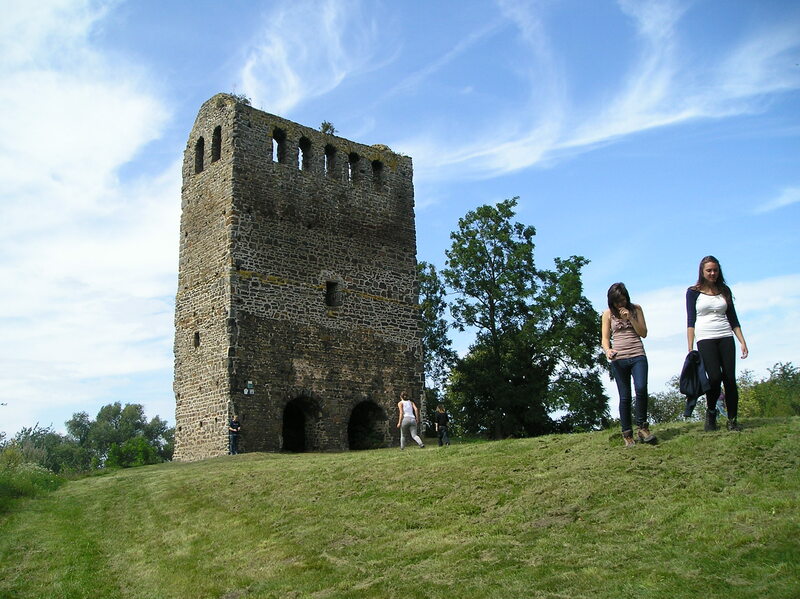 A deserted medieval village, near Hundisburg, Germany. My archaeology-themed photograph of a site visit, as part of the Grampus Heritage‘s 2010 project in Magdeburg. 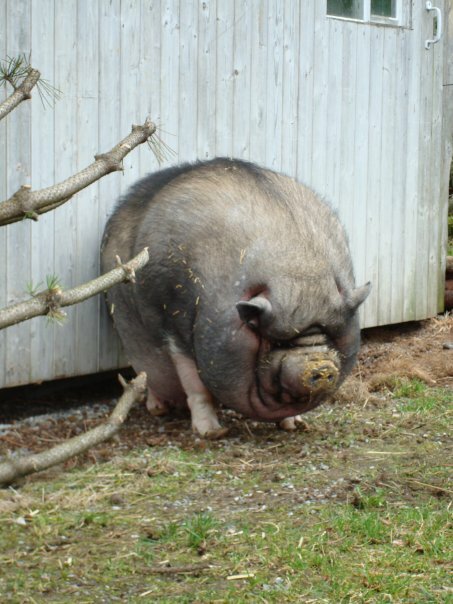 Although a delightful pig, this is definitely not an archaeology-themed photograph. I wish any participants the best of luck!